Soozier’s extra-thick, extra-wide Yoga Mat offers a cushioned, non-slip surface ideal for floor based exercises. The lightly textured surface provides traction and comfort for stretching, yoga, Pilates and any other fitness need. 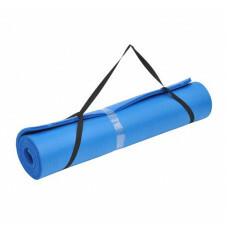 Yoga mats are also perfect for camping, traveling, hiking, picnics and more. The Soozier Yoga Mat is a durable, versatile addition to anyone's fitness collection; it even comes with a carrying strap making it easy and comfortable to take with you anywhere.